The weekend seemed a very good time to transplant the tomato plants we had started in February. 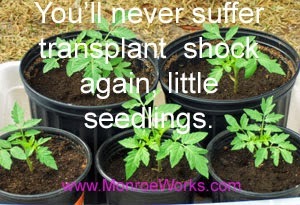 So, rather than go over the seed planting like I promised, I thought I would describe the transplanting procedure first. We'll do the seed planting next, both into seed flats and directly into the bed. Saturday morning was the perfect day to transplant: cloudy and mild. I'm ready with a cover just in case we get a storm (I've been coddling these plants for weeks, I'm not letting anything happen to them now). 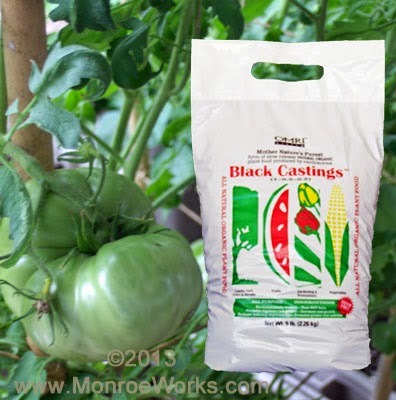 The secret to transplanting tomatoes successfully. Pull back all the mulch and wet the bed beforehand. 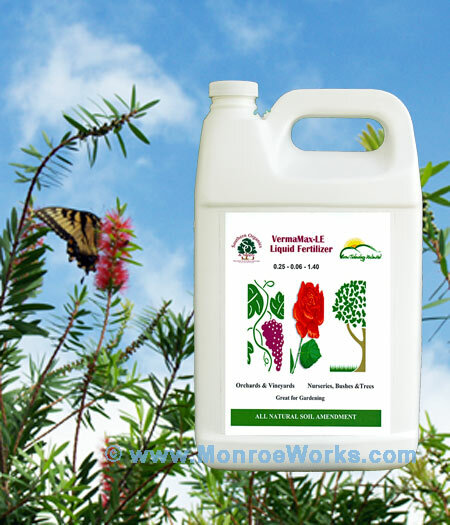 Our sandy soil tends to dry out, you may not have to pre-wet yours. 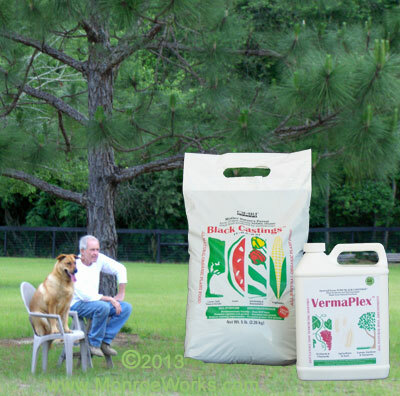 Water the plants with a mixture of VermaPlex (20 parts water, 1 part VermaPlex). Treating the plant's root ball prio to setting out is the secret to avoiding transplant shock. 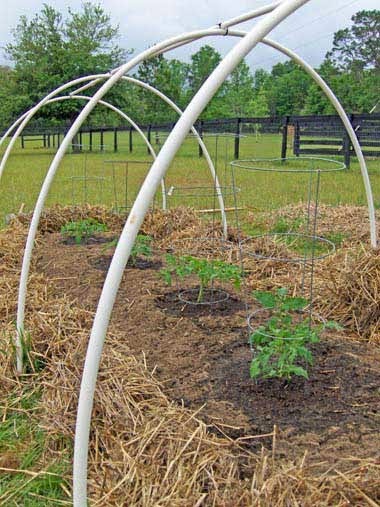 Place the tomato plant pots on the bed to get the correct spacing (about 24 inches apart). Remove the pot and dig out a hole to fit the plant. Make the whole deep enough to bury the plant all the way up so as to leave only the top leaves and grow-top above the ground. The plant will send out roots all along the buried stem, making the plant stronger. Placing the pot with the plant still in it into the hole to check the hole depth. When the hole is deep enough, drop a handful of Pure Black Castings into the hole and pour in some of the VermaPlex water mixture. 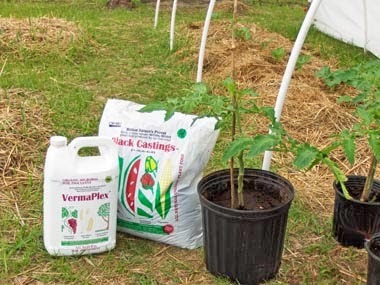 The castings will slow-release-feed the root ball and the VermaPlex will inoculate the castings/soil and jump start the plant. Place your hand palm side down on top of the soil in the pot, with the plant stem between your index and middle finger; gently turn the pot upside down resting the top of the soil in your one hand and pull the pot off with the other hand. Toss the empty pot, cup the bottom of the root ball with the same hand and turn the plant right side up. Carefully place it into the hole. Back-fill the hole with a mixture of 80% compost/potting soil and 20% Pure Black Castings. Make sure to eliminate any air pockets by tapping in the mixture into the hole. 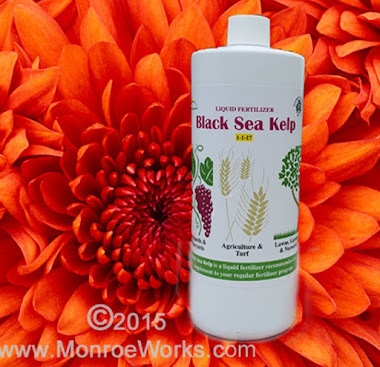 After the hole is filled, scatter Pure Black Castings around the plant and water the plant in well with more of the VermaPlex/water mixture, to boost the microbiotic content of the soil and wash in any air pockets. 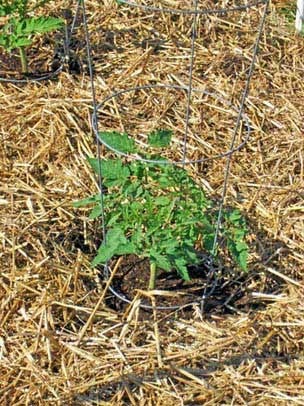 Set a wire cage (got mine at Lowe's) suitable for tomato plants. Trim away any leaves that may touch the ground. Re-cover with mulch. After a cloudy morning, the sun came out brightly by afternoon, but the plants didn't wilt at all. We'll check back tomorrow for any signs of stress or shock.